You wash your dishes but what about the underside of your taps? The dish drainer? You’ll eat more safely when these things are clean. Never spray the switchboard directly. Instead, spray disinfectant or rubbing alcohol on to a paper towel and wipe down the surface. Then use a cotton bud to get into every corner of the actual switch. You’re right to dread what lurks underneath. Get to those hard-to-reach spots using a flexible microfibre duster. How many times do you refill the cookie/cereal/sugar/flour jar before you think to wash it out? They are known to carry salmonella, yeast and mould, so make sure you thoroughly wash with detergent and hot water between each use. Take care to clean the rubber seals and allow to air dry before filling with anything else. Remove the batteries from the back, then wipe clean with a cotton cloth dipped in rubbing alcohol. Next, use a cotton bud dipped in rubbing alcohol to carefully clean around the buttons. If there’s grime underneath, use a toothpick to get in the crannies. Dry using a microfibre cloth. Though you only place clean items on your dish rack, the water that drips from your cutlery and plates can cause mould and mildew. Disassemble your rack and scrub each part with a sponge, detergent and hot water. Make sure you reach deep inside the utensil holder, using a toothbrush to get into every corner. Then, soak each part in a sink of hot water and a tablespoon of bleach. Leave for two minutes, rinse, then leave to air dry. The drawers in your fridge are a hot spot for salmonella, listeria and other nasties. Take out the drawers and wash with a clean sponge and hot water mixed with detergent. Rinse and wipe dry with a clean towel. Also, separate meat from vegetables to avoid cross-contamination. If your bin ever begins to smell, you know it’s long overdue for a clean. Put on some rubber gloves, completely empty your bin (removing any food particles stuck to the bottom), hose down, then pat dry with paper towel. Liberally spray with a disinfectant, scrub with a toilet brush, then rinse and allow to air dry. Want to get your sink looking sparkly and new again? First, wet the entire surface. Then pour bicarb soda over the area and scrub using a toothbrush. Rinse, then pour white vinegar on to paper towels and line your basin with them. Allow them to sit for 20 minutes, then wipe and throw away. Wash again with soapy water, paying attention to the faucets, knobs and sink stopper, before rinsing once more and allowing to dry. Sickness spreads very easily via doorknobs and handles, touched by everyone but cleaned by no one. 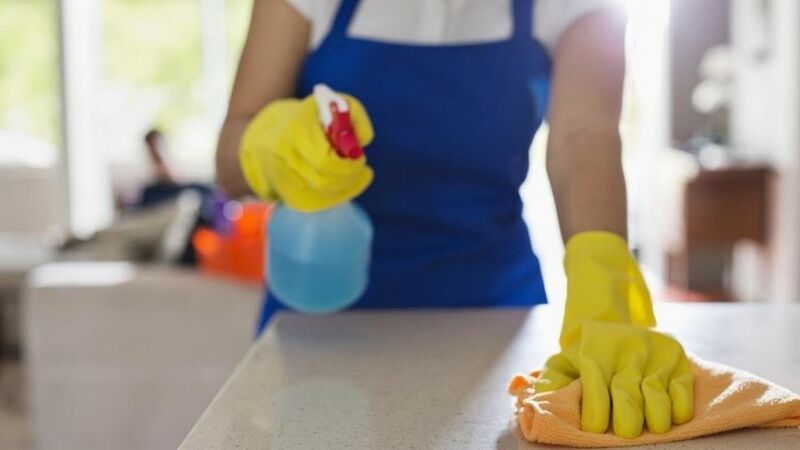 To clean, spray with a gentle disinfectant, then wipe down with a clean towel. First, remove the cover and wash separately from the pillow. Pre-treat any stains then machine wash on a delicate wash cycle, along with the pillow itself. Tumble dry or leave to dry in the sun – taking care to fluff back into shape. If the pillow’s foam, rinse clean by hand and gently press out the water before leaving to dry. Think about it – they’re warm, moist hotbeds for nasty microbes. Give them a quick clean by soaking them in a solution made from nine parts water to one part bleach, to instantly eliminate bacteria. Rinse with water, wring out to dry, and they’re good to use again.